Changes to virtual networks often create problems. VMware vCenter Operations Manager finds root causes by integrating with more VMware tools. The days when IT architects and admins had to be sold on virtual infrastructure performance tools have passed. Now the choice is whether to use a VMware tool like vCenter Operations Manager or one from a third-party provider. And improvements to VMware's tool may help make that decision easier. Figure 1. VCenter Ops allows IT admins to customize their view of the infrastructure based on specific business needs. Note: All figures provided courtesy of VMware Inc.
VMware's virtual infrastructure performance monitor, vCenter Operations Manager, is designed to detect and resolve root causes of infrastructure problems. 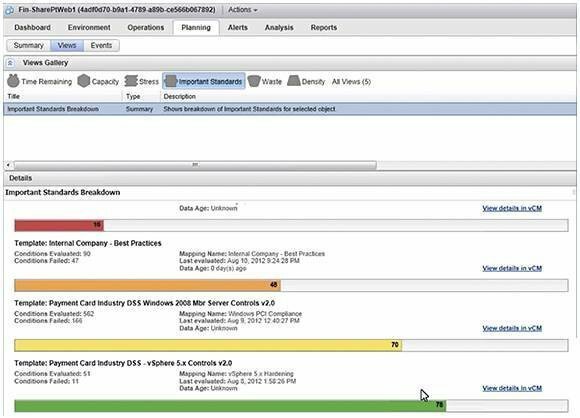 The latest edition of vCenter Operations Manager, version 5.6, launched at VMworld Europe 2012, introduced custom configurations and better integration with other VMware tools. Figure 2. 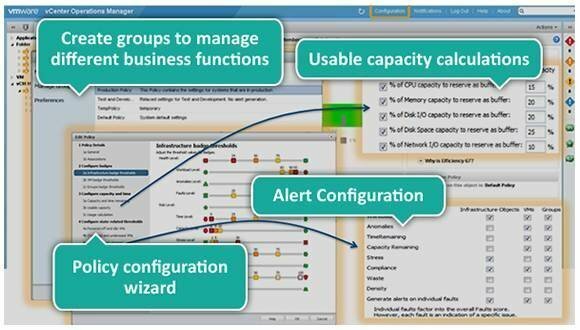 Here are the customizable alert and policy options in vCenter Operations Manager. create groups that are dynamically based on what the virtual machines (VMs) are actually running (such as Exchange, IIS or another environment) as well as VM power state, CPU, memory, disk and other variables. VCenter Operations knows which applications are running in which VMs and groups them so that an administrator can track performance and capacity and perform troubleshooting on objects such as all e-commerce servers. create policies, calculate capacity, configure alerts and set thresholds based on dynamically created groups, as shown in Figure 2. Admins can use this control to configure vCenter Operations to, for example, cancel alerts for all Web servers running IIS and on the development cluster. Figure 3. An example of root-cause problem analysis in vCenter Ops. discover root causes of problems automatically, as shown in Figure 3. Many performance and monitoring tools fail to find the root cause of a problem and explain what's wrong. Other tools may identify a multitude of problems without tying them to the underlying cause, which hinders resolution and creates confusion. 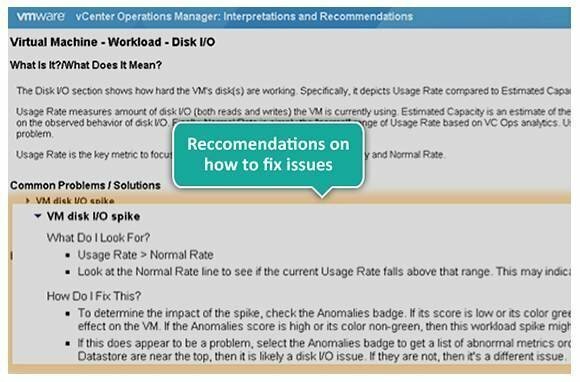 VCenter Operations Manager generates verbose explanations of problems and recommendations on how to fix the issue, as illustrated in Figure 4. This level of attention to the issue is welcome and unique to vCenter Ops. Figure 4. Here, a problem is explained, with a recommendation on how to fix the issue. VCenter Operations Manager is constantly "learning" about the virtual infrastructure. From an inventory and performance stats, it creates extensive statistical analysis over time to determine what is and isn't normal. VCenter Operations' 10+ badges and health scores (three of the most important badges are shown in Figure 5) identify unique characteristics of the virtual infrastructure and continually update with the latest relevant data. Figure 5. These are vCenter Ops' health, risk and efficiency virtual infrastructure badges. These scores are the most important thing to check, on a daily basis, to see if your virtual infrastructure has a problem. When changes are made to the infrastructure -- such as faster storage or a new server joining the cluster -- these scores will change. These changes must be tracked and correlated with potential problems that may occur. Despite how common this causal relationship is, most performance tools don’t connect changes to performance problems. Admins who use tools that correlate changes to problems should be aware that this needs to be done over time; in many cases, problems are not immediately evident. Figure 6. Integration with VMware Configuration Manager enables the admin to catch and address a problem related to a recent architecture change. 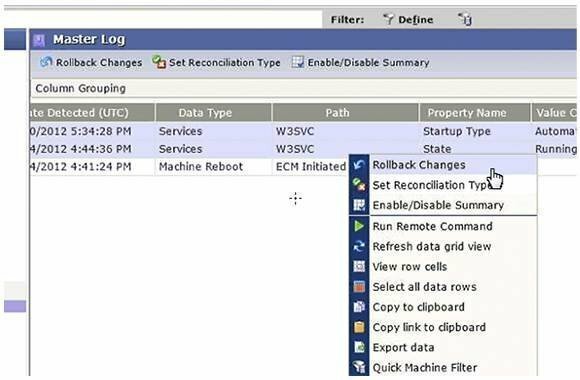 New integration between vCenter Operations Manager and VMware Configuration Manager automates the process of tracking and correlating changes to problems. For example, if registry changes were made to a Web server that then experiences poor performance, Configuration Manager identifies the problem and the admin can address the issue by clicking Rollback Changes (Figure 6). Configuration Manager can also help organizations maintain compliance. Your company may be required by the payment card industry (PCI) security standards, the U.S. Health Insurance Portability and Accountability Act (HIPAA) or other regulations to maintain host configurations in a certain way, with host-based firewalls enabled, for example. Even without regulatory oversight, IT admins often must meet internal configuration standards. Figure 7. Config Manager lists which groups of VMs meet various compliance standards. 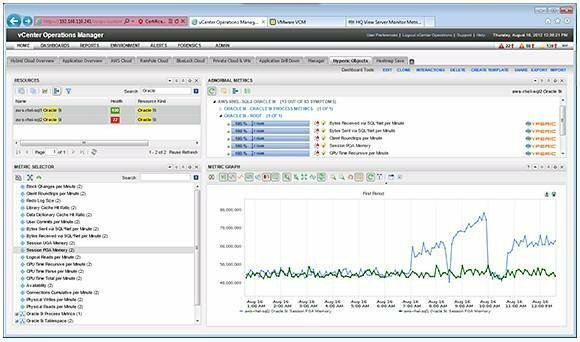 In the past, vCenter Operations offered vCenter Infrastructure Navigator to monitor traffic on the virtual network and show application dependencies. This helped prevent application outages due to ambiguity about VM dependencies. VMware Site Recovery Manager now uses these dependencies as protection groups. It allows vCenter Operations to dynamically group VMs for performance and capacity analysis. Application performance has always been the best measure of end-user application health, but obtaining it with virtual infrastructure monitoring tools has been difficult. VCenter Ops 5.6 can analyze OSes and applications data because of integration with VMware's Hyperic. The whole picture -- from the ESXi host to the VM to the OS and, finally, the applications -- is visible in vCenter Ops (Figure 8). Figure 8. Hyperic and vCenter Operations Manager monitor the health of an Oracle server. Upgrades in vCenter Operations Manager Suite 5.6 focus on solving real-world problems for end users and applications. IT admins will appreciate the additional problem-detail explanations and recommendations for issue resolutions, as well as integration with vCenter Configuration Manager and Hyperic. The badges are a visually appealing way to stay current with the status of your virtual infrastructure's health. Another benefit of vCenter Operations is it quickly deploys as a virtual appliance (two virtual appliances in a vApp). A free 60-day evaluation mode version of vCenter Operations lets you try out these features. All figures provided courtesy of VMware Inc.